Photo by Flickr user bored-now. Sherry Hollingsworth nearly collapsed at her aunt’s funeral. The death itself had rattled her, but not nearly as much as the chest pressure that struck that day and the diagnosis that eventually followed: Hollingsworth had a broken heart. Forget the clichés. This isn’t the story of a woman metaphorically dying inside. Half of Hollingsworth’s heart literally stopped pumping blood, and an otherwise healthy 50-year-old woman was soon diagnosed with the very real — and increasingly diagnosed — condition known as Broken Heart Syndrome. For Hollingsworth, that was enough — the toxic mixture of intense grief and unrelated work stress produced just the right amount of stress hormones to trigger a condition that’s long been either disregarded as the stuff of legend or mistaken for a typical heart attack. 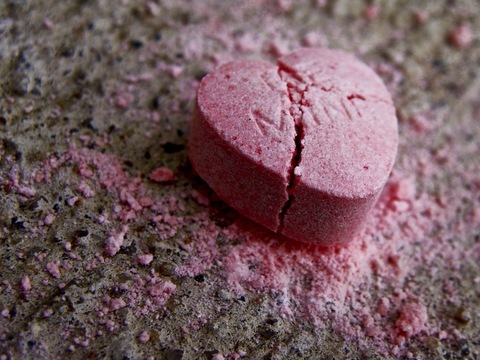 On this Valentine’s Day, Dr. Ilan Wittstein, assistant professor of medicine in the Division of Cardiology at Johns Hopkins Hospital, reflects on what he’s learned from treating hundreds of these “broken hearts” — Hollingworth’s included. You had a role in discovering Broken Heart Syndrome. How did that come about? Wittstein: I actually started seeing a few cases in 1999 and just happened to see three or four women with the same symptoms over a period of a couple weeks. They were displaying the usual signs of a heart attack — shortness of breath, EKG abnormalities, chest pain. But a surprising commonality was that each had experienced something traumatic. One had just lost her mother, another had been in a near-fatal car accident and another had just had an unexpected reunion with a loved one. The fourth walked into a dark room and 70 people popped out and yelled ‘Surprise!’ at her. When we looked at their ultrasounds, we could see that the heart muscles were very weak. But a number of other things jumped out, too. There was no evidence of coronary heart disease or blood clots in their arteries; these were not the kinds of arteries you would expect in someone having a heart attack. And their recovery period was also fairly rapid — some within just a few days. After seeing three or four cases, we started calling it ‘stress cardiomyopathy,’ which translates to stress-related ‘weak heart muscle.’ We nicknamed it ‘Broken Heart Syndrome’ because many of the cases had been triggered by the death of loved ones. What is the medical explanation? Wittstein: This seems to occur in people that have been exposed to some kind of significant emotional shock or physical stress. On the physical side, it can be an infection, a stroke, a rapid drop in blood sugar, even physical exercise. Another commonality we were seeing in these patients was very elevated levels of stress hormones — in some cases up to 30 times the levels we would see in normal patients. Our theory was that in the setting of trauma, the body produces a sudden surge of these hormones to produce the ‘fight or flight’ reaction that’s essential to survival. But if they’re produced too quickly, they can go directly to the heart and cause an adverse reaction in the heart muscle. One theory is the excess adrenaline causes a dangerous influx of calcium. All heart cells have receptors that bind to adrenaline. If you’re nervous, your heart starts beating faster because adrenaline binds to the heart to tell it to beat stronger and faster. When that adrenaline surge happens, calcium also rushes into the heart cells to allow the heart to contract more vigorously and squeeze more strongly. But if too much calcium floods the cells, instead of beating more vigorously, the heart becomes overwhelmed and stunned. That means that at least temporarily, the heart cannot be a very effective pump. So this is unlike a heart attack, where the cells are injured or killed. These heart cells are not killed. They’re just temporarily dysfunctional. You say that’s one theory. Is there another? Wittstein: Well, when we talk about people having heart attacks, we’re talking primarily about a clot in three big blood vessels that supply the heart. But in cases of Broken Heart Syndrome, the coronary arteries appear completely normal. There are no blood clots, but the blood that is flowing down those arteries seems to be moving slower. And that makes us wonder what’s happening in the blood vessels we can’t see during a routine heart catheterization. Downstream from the big blood vessels are littler offshoots. And it’s believed that large amounts of stress hormones can cause dysfunction in these small blood vessels, slowing down the blood and affecting the flow to the heart. Wittstein: The symptoms mimic almost exactly the symptoms of a true heart attack: Chest pain, weakness, pain that radiates down the arms and up into the neck, becoming very sweaty. Some have nausea and vomiting. The very fact that the symptoms are similar is why we don’t ever recommend people try to figure out whether they’re having a true heart attack or Broken Heart Syndrome. Just seek medical help. But one of the main symptoms is one we can’t see — a “ballooning” of the heart, correct? Wittstein: That’s right. Another name for this is ‘Apical Ballooning Syndrome.’ The Apex is the tip of the ventricle, the main pumping mechanism for the heart. With Broken Heart Syndrome, the middle part of the heart and the top are not squeezing, but the bottom part seems to be spared. Imagine a boxing glove and what it looks like after all of the strings are pulled tight. The bottom is narrow, and the middle and top part are wide. That’s what the heart looks like with Broken Heart Syndrome. It isn’t really a ballooning out — it just looks like that because of the difference in the top and middle part. People who have true heart attacks do not have hearts that look like this. So when we see this unique shape, we often know immediately what the condition is and we can treat it appropriately. How often does this result in death? Wittstein: The simple answer is that this can be deadly. But just like traditional heart attacks, there are small heart attacks and there are large heart attacks. Some do very well. Others don’t survive. The same seems to be true for Broken Heart Syndrome. Some need to be put on a ventilator, some need medicine, some need an intra-aortic balloon pump to help pump their blood temporarily until their heart recovers. But the vast majority of people who get this live. Only about 2 percent die. If they’re rushed to the hospital and receive the medical support they need, they seem to recover very quickly. Unlike a person who has a massive heart attack and never gets back to baseline, the person who has Broken Heart Syndrome usually recovers within a couple of weeks. And as of right now, it looks like the recurrence rate can range anywhere from 5 to 10 percent, which is very low. Wittstein: After those first few patients in 1999, I started scouring the literature to see what was out there. The only thing I came across were a few studies out of Japan about “Takotsubo cardiomyopathy” — which turns out to be the same thing. But these articles never made it out of the Japanese literature. When we published a report on the syndrome in the New England Journal of Medicine in 2005, the consensus was that this is ‘interesting but probably uncommon.’ Thirteen years later, we’ve seen over 250 patients with this at Johns Hopkins alone. Now that doctors know the signs, it’s turning out to be fairly common. Through retrospective studies, we’ve been able to determine that 2 percent of the people who were rushed to a cath lab with a suspected heart attack actually had Broken Heart Syndrome. That’s quite a lot when you think about the millions worldwide who are rushed to the cath lab every year. For women in particular, it’s even higher — anywhere from five to seven percent. My guess is the number of cases diagnosed is going to keep growing in the years to come, as more doctors learn to identify it. Are certain people more susceptible to this than others? Wittstein: Probably any individual is capable of developing this if the stress is great enough. But we had been following this for several years before we saw a man who was affected. A full 90 percent of the patients who show up with this are women. That’s pretty remarkable given that traditional heart attacks are much more prevalent in men. Except in a handful of cases, the women who are getting this are primarily older — 55 or older and post-menopausal. We’re not sure why, but we know that the female hormone estrogen is very important for blood flow to the heart. The lack of it is one of the reasons people develop heart disease later in life. If you inject it into a person’s arteries, blood flow increases. Estrogen can also help protect against the negative effects of some of those stress hormones. So it’s a reasonable hypothesis that if you are 25 and walk into dark room and a bunch of people yell, ‘Surprise,’ you may make the same amount of stress hormones, but you’ve got higher levels of estrogen to counterbalance them. We’re also starting to see that people who are developing this have a lot of anxiety and depression and may be on certain medications that affect the way their adrenaline is metabolized. And the final piece is there may be even genetic predispositions. We hear about couples passing away within a very short time span of each other. Could Broken Heart Syndrome be the cause? Wittstein: Maybe in some cases, but there’s a difference between a death from Broken Heart Syndrome and the husband or wife who dies two months after their spouse. What we’ve been talking about is a sudden occurrence immediately after a shock. Given all of this, would you say there’s a good chance that someone diagnosed with a heart attack in the past could have actually been experiencing Broken Heart Syndrome? Wittstein: It’s quite possible. There may be people out there who are 65, and 10 years ago they experienced chest pain and a weak heart even while their arteries looked fine. If you’re not sure, your doctor can usually review your records and determine long after the fact whether you had this condition. That’s important because the long-term prognosis for someone with Broken Heart Syndrome is certainly better than the long-term prognosis for someone who experienced a heart attack. And that could have a big impact on the way you live your life.